My student life is already started and I feel surprisingly good! I can't tell I'm a big fun of economy but sometimes lectures even interesting. I dress in very casual way to the college, comfort is must important. Sometimes I wear heels but only If I have one or two lectures! 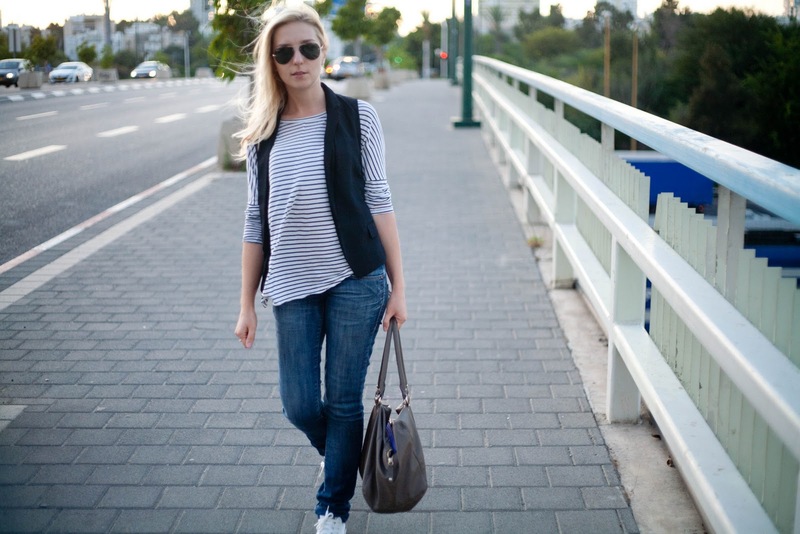 Vest is the good solution for who can't wait to wear blazer and is still hot outside! Like me! Good thing is that november is already here and temperature is going down every day. Very soon I will be able wear my lovely trench and sweaters!!! Love the vest when is hot outside!!! So cool easy and chic, LOVE it!!! I love your laid back style. Perfect for class. That vest is a brilliant alternative to a blazer in warm weather. Wish I were in Tel Aviv! Great pictures. You look so natural and effortless. Love the outfit, exactly something I would wear to uni. that's what I call casual chic!